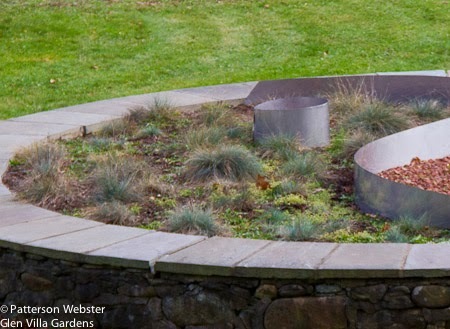 My first attempt to use ornamental grasses was in a section of the garden I call the yin yang. An old resort hotel once stood on the property (to my amazement, I find I haven’t written about that… must do so soon. ) In front of the hotel was a low circular stone wall. Horse-drawn carriages would drop guests off at the front door of the inn, then proceed around the circle and head back out the drive. The stone circle is on the left. 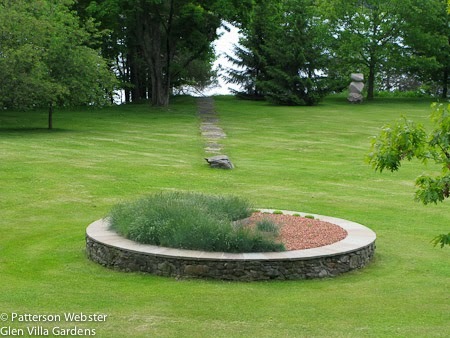 When we moved into Glen Villa, the centre of this circle was full of highbush cranberry bushes (viburnum trilobum). It’s a wonderful shrub and I’ve planted it elsewhere, but those bushes had grown too large for the space. The proportions were wrong. So we pulled them out. 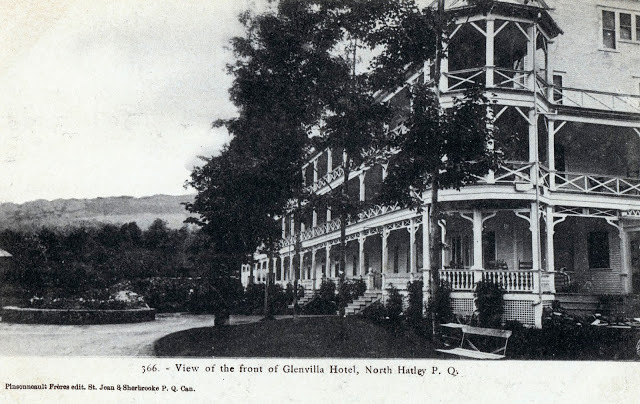 Since my husband had grown up at GlenVilla, I thought it would be interesting to connect the story of the hotel with the story of our family. Since we lived in China during the Cultural Revolution, from 1969-1971, I decided to plant the circle in the shape of the yin yang symbol. For the first few years, I used annuals of contrasting colours and heights, to emphasize the notion of opposition that is integral to the symbol and the Taoist philosophy behind it. 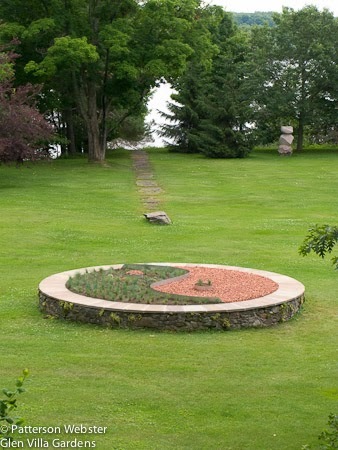 Looking down on the yin yang, towards the lake. The path behind the circle was built over 100 years ago to keep hotel guests’ feet dry. The sections of the yin yang are separated by a stainless steel strip. 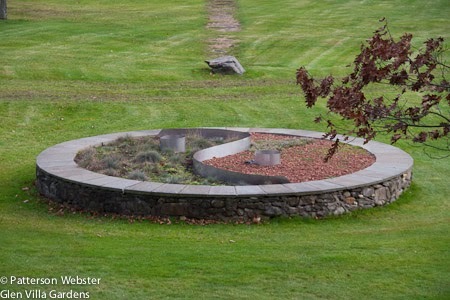 I planted the clumps of grass in rows, a contemporary planting style that I found appealing. What I failed to do was to read anything about how to maintain it. That was mistake #1. 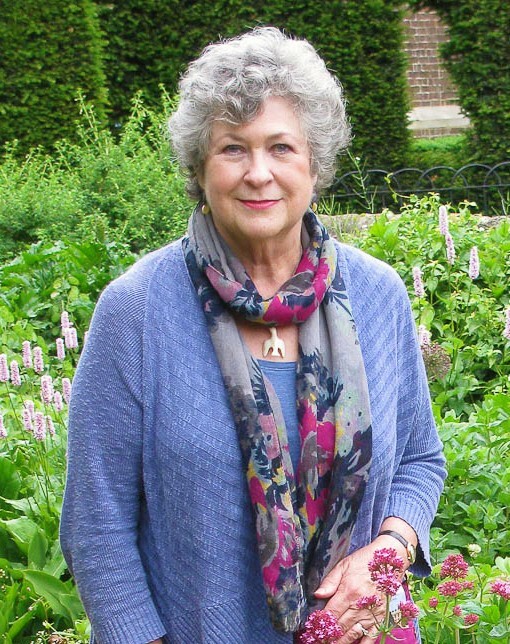 You’ve probably heard the old saying about perennials: in the first year they sleep, in the second year they creep, in the third year they leap. 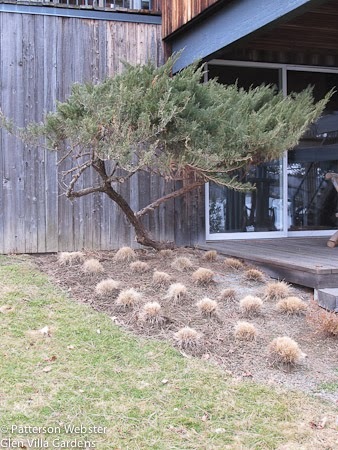 My festuca glauca did not wait for year three. By mid-summer of the second year, it was totally out of control. My neat tidy design was a horror to behold. I promise, there was a design lurking under that mess. I am not a particularly tidy person. I don’t care that much about weeds in the garden. Yet it was obvious: something had to be done. It took most of an afternoon to cut the grasses back. They looked pretty awful when we were finished but I figured that if we removed half of the clumps, the yin yang would look better the following year. So, come autumn, that’s what we did. We removed all the plants, divided the clumps and replanted. everything in nature contains a piece of its opposite. Then came a wonderful question: what to do with the extra clumps? Where could they go? On a large property, there is never a shortage of spots. But choosing the right place can take time. Or should. Was I busy that fall or did the location seem obvious? I gave the question only a minute’s thought. That was mistake #2. 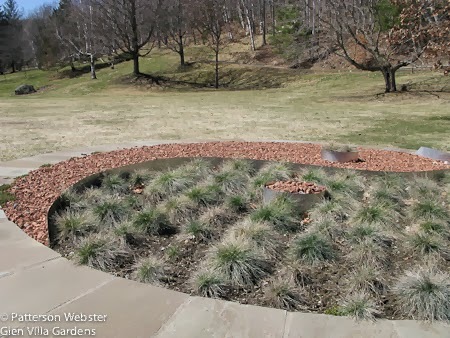 I knew the grass did well in full sun and dry ground — it had thrived in similar conditions in the yin yang. So in the fall we planted some clumps in a gravel bed near the house, keeping them in straight lines that suited the space. 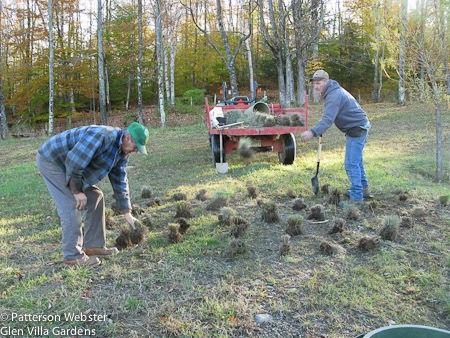 We planted more near the beginning of the boardwalk that circles the Skating Pond in the upper field, arranging them in a triangle. I washed my hands and congratulated myself on a job well done. That was mistake #3. I don’t remember why I decided to plant a triangle of grass. Come spring, there was no sign of the grass by the skating pond. There still isn’t. The clumps by the house looked dead. They were. The grass was dead but the lines were straight. Once again I had failed to do my homework. 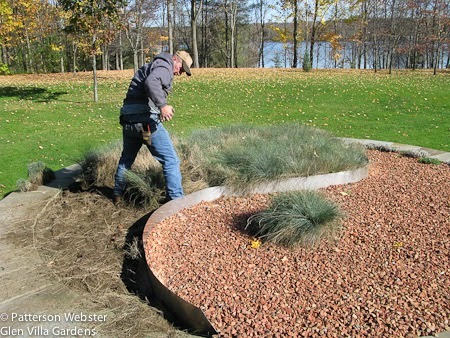 Because even the most cursory glance at an on-line source would have told me that the fescue does not like being moved in the fall. It doesn’t like being divided, either. Or at least, not at my house. More than three years later, the re-planted clumps still struggle to survive. I took this photo last week. And check out the close-by below. Granted, they have a bit of competition from some plant material I didn’t put there. Surely those aren’t weeds I see? To avoid mistake #4, I finally consulted some on-line sources. Blue fescue is said to be a short-lived grass. So I’m blaming its poor appearance on old age. There may be other explanations, and I’d like to know them, if there are. Because I have to do something about the yin yang. I want to keep the idea (unless I come up with a better one…) but change the look. So, what should I do? Ideas, anyone? 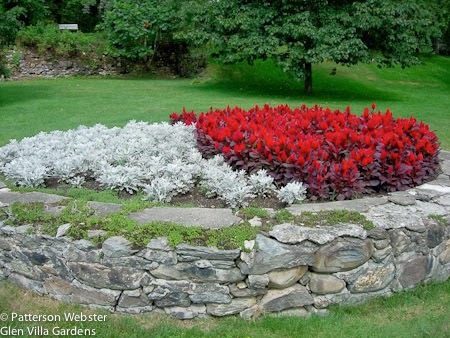 I would go back to the annuals in the yin yang; it’s pretty small for the grasses which should get out of control in no time. Maybe doing one half of it with peonies (favorite) cutting down on the back breaking work too. Interesting ideas, Robert. I also love peonies. But what to use as contrast? Peonies one side and roses on the other, this could balance it off. Then I would fill with dusty miller, begonias, geranium, lavender, tiger lily, herbs or whatever else they have on special at the nursery that day, Trying to maximize the color here with least amount of effort of course at all times! How is the deer population there now. Here they don’t eat geraniums or begonias. Tulips, pansies, daffodils are also consumed as soon as they blossom. One thing I like out here and you don’t have there is the rhododendron (450 species here) and counting.